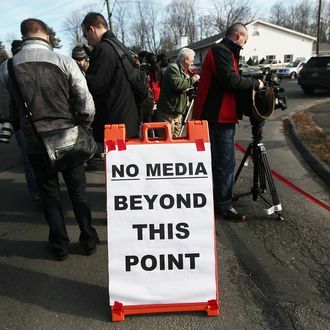 As is often the case with attention-grabbing tragedies like the one that occurred at Sandy Hook Elementary School in Newtown, Connecticut yesterday, the media managed to upset witnesses, members of the community, and the general public while pursuing the story. This was particularly true in the immediate aftermath of the shooting, when reporters rushed to interview the school’s young students about their experiences. Children were quoted everywhere from the New York Times on down, and CNN, NBC, ABC, and other networks broadcast footage of their conversations with them throughout the day — though most of those videos seem to have been taken offline after the news organizations were charged with exploiting traumatized kids. CNN’s Wolf Blitzer and others have since assured viewers that they try to be “very sensitive” while dealing with children and “always ask permission” to do so from their parents, Anderson Cooper has sworn off the practice, tweeting last night that, “Of course i will not be interviewing children from the school. I do not think that is appropriate at this time.” Many have pointed to Poynter’s guidelines for interviewing kids, which include questions like, “What is my journalistic purpose in interviewing this juvenile?” and “How would you justify your decision to include this juvenile in your story to your newsroom, to viewers or listeners, to the juvenile’s parents?” Basically, first-hand accounts from frightened kids might make make good television, but it often doesn’t do much to actually advance the story — especially when many of the witnesses aren’t really capable of wrapping their minds about what they just saw or heard. 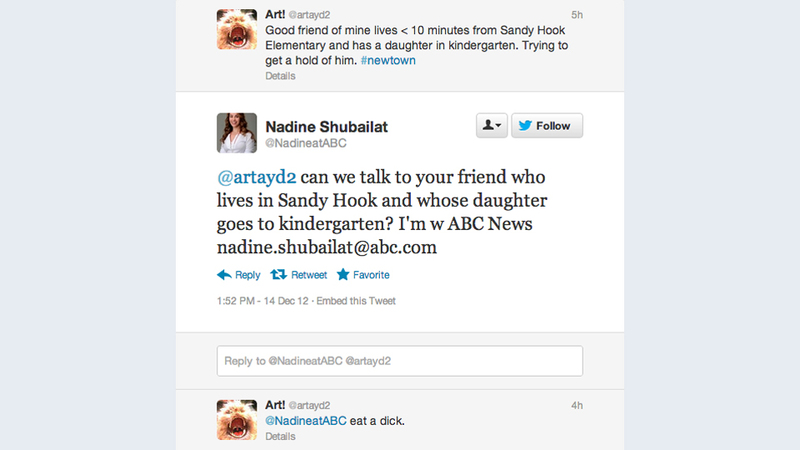 A Reddit user claiming to be from Newtown posted a longer version of the same sentiment to the message board on Saturday. After recalling a happy childhood in the town “love” present at Friday night’s service for the victims at St. Rose of Lima Roman Catholic Church, he wrote, “You can comprehend my anger at hearing cameras go off as I watched my best friends father break down.” He went on to sarcastically congratulate the “24 hours news media” for getting “something to talk about for days…Now you can have 25 pieces of fodder to discuss mental illness, gun control, safety regulations, and what ever else you need.” Unfortunately for community members who would rather be left alone, the media won’t leave town for a while, and the discussions and clamoring for details (here included) will last even longer. Still, as some of the angrier reactions remind us, it’s important to remember that for the people in Newtown, working through Friday’s events is much more than a job.